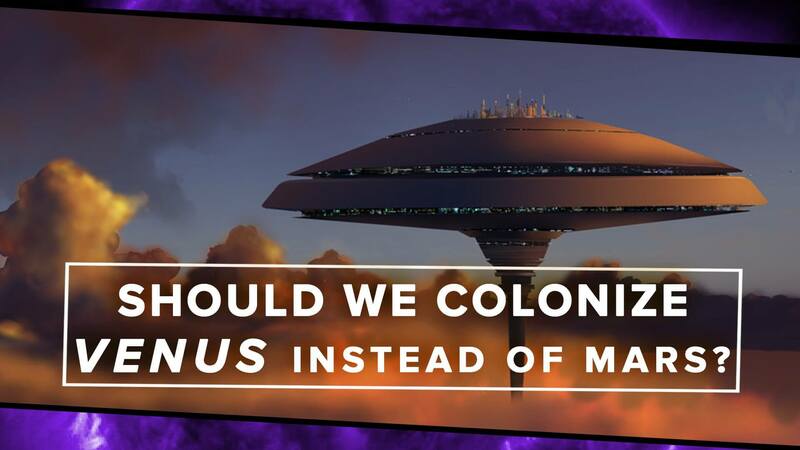 Home » SHOULD WE SEND MEN TO VENUS INSTEAD OF MARS? When it comes to manned spaceflight, a manned mission to Mars has been the ultimate goal since the 1960s; after the Moon, it’s the most logical place to go. But what about Venus? We can’t land on the surface of Venus. At least, it would be almost impossibly difficult to design a spacecraft that could survive the planet’s hellish environment. With a carbon dioxide rich atmosphere at a pressure about 92 times what we feel on Earth and an average surface temperatures upwards of 900 degrees Fahrenheit, it’s not a welcoming environment. But about 31 miles above the surface, Venus becomes almost Earth-like. Above most of the clouds there’s enough sunlight to provide solar power, the temperature is colder but still warm enough for liquid water to exist, and the gravity is about 90 percent of what we feel on the Earth. The gases at that altitude can also support life, albeit with a little help. There’s more than enough carbon dioxide for plant growth. The nitrogen in the atmosphere along with hydrogen gathered from floating sulfuric acid droplets could be turned into the necessary elements to support human life. So why not build a floating city? Or explore the planet with a dirigible feature a manned cabin slung underneath? It’s something scientists at NASA’s Langley Research Centre recently proposed, and it’s a compelling idea. And it’s not the first time NASA has explored manned missions to Venus. In the 1960s, Bellcomm, a division of AT&T established to assist the space agency in research, development, and overall questions of systems integration, studied mission concepts to send upgraded Apollo hardware to Venus. These were only ever concept studies, but it’s still a really fascinating prospect. Really, I’m just a sucker for Venus and would love to see a more dedicated study of our hellish neighbor. I’ve covered all of these topics elsewhere. For more on the logistics of a floating city on Venus, check out this article on Motherboard. For more on NASA’s Venusian exploration by manned dirigible, check out my latest on Nerdist. And for a look at our history exploring Venus and some of the vintage concepts for a manned mission to our planetary neighbour, check out my old blog posts here, here, and here. And yes, that’s seven year old me presenting my second grade science project on Venus.